This past weekend, I took a trip to Target en famille and noticed my husband sneak away to peruse the men’s denim section. I thought to myself, Is he trying to avoid the toy aisle…or is he looking for new jeans? Perhaps it’s time for me to intervene. The men in your lives may enjoy shopping (mine does not), but regardless everyone can use a little wardrobe advice. And now that the “Dad Bod” is getting so much press, if your guy or friend (or dad!) has one, why not celebrate it with some cool new duds? Which is why we turned to HEUCY Gal and style guru Nicola Harrison Ruiz to provide some invaluable men’s styling tips. 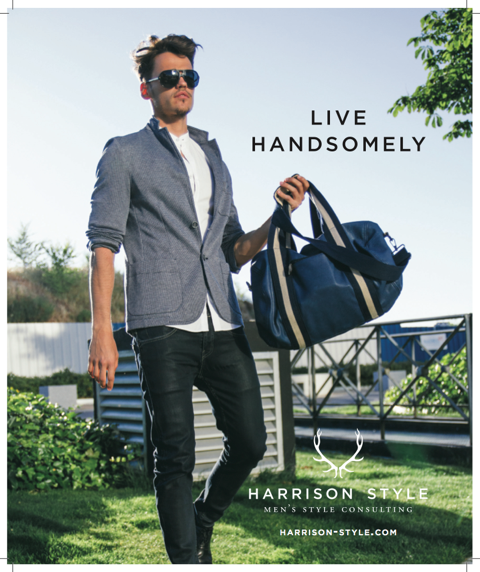 Nicola recently launched a men’s styling website and consulting service, called Harrison Style. She can also be seen wearing the Perfect Ten dress on heucy.com’s “HEUCY Gals” page. Trust us, you’ll want her advice! Here’s Nicola’s very simple, extremely doable take on Easy, Breezy, Handsome: Effortless Men’s style. Enjoy! It’s spring! Time for dresses and sandals, no more coats and tights and boots. No more taking 10 minutes just to layer up to face the cold. Spring and summer is all about easy, breezy dressing. But what about the men in our lives? As a personal stylist for men and women I find that while women have an easier time dressing in the warmer months, men tend to get a little sloppy when the temperatures heat up. So here are a few tips to pass on for effortless spring style for the guys. Everyone needs a good pair of dark denim jeans that fit right. They should be slim but not too skinny and definitely not baggy. Be sure they have a slight stretch and they’ll be just as comfy as the ones you’ve been wearing for the last ten years. I love Seven for All Mankind, Standard fit, or J. Brand, Kane fit, although there are number of brands out there with a slim straight leg, you just have to try a few on to get the fit that’s right for you. Once you’ve got them WEAR THEM! I find that some guys save their dark denim for “going out” or dates. Don’t do that. Wear them to get coffee, to walk the dog, to go to brunch with your wife and kids. They instantly upgrade your look from those faded old jeans you’ve been wearing religiously for the past few years. There’s nothing wrong with having a favorite sweatshirt or hoodie – just make sure it’s modern, flattering and fits well. Vince and Theory have some great options that are still casual but are more streamlined than that balloon-like sweatshirt you’ve been holding onto from your college days. Never wear your gym sneakers unless you’re going to the gym. Instead get a pair of what I call “street sneakers” to wear with jeans and casual pants. Converse and Adidas have various “cleaned up” versions, as do more designer lines such as Common Projects. Buy a thin vest (not the puffy kind) to layer under a sportcoat when it’s chilly, and to wear over a shirt or a sweater as the weather warms up. (It will also give you more pockets to store your keys and wallet so your pants don’t look bulky). You can’t go wrong with Barbour or Salence. Hope you found this as useful as we did! Happy Monday.